Review of Home Safe Extra Tall Walk Through Decorative Baby Gate, 28"-48"
Home Safe Extra Tall Walk Through Decorative Baby Gate, 28"-48"
High gate protects children or animals from escaping. Strong iron-metal gates prevent children from breaking through. Simple, modern style fits with any household style. Easy to construct, easy to break down. One-touch lift open for adults to get through. A little expensive for growing families. Screws into walls for security. 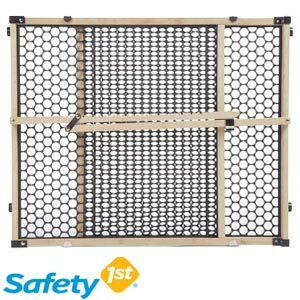 This is the summary of consumer reviews for Home Safe Extra Tall Walk Through Decorative Baby Gate, 28"-48". The BoolPool rating for this product is Excellent, with 4.60 stars, and the price range is $54.00. 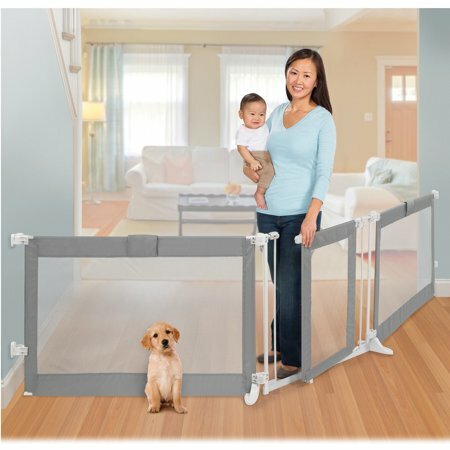 Most customers rave about the Home Safe Extra Tall Walk Through Decorative Baby Gate, which can extend up to 2 feet to keep children secured in the pen. The gate fits into differently sized doorways, openings, hallways, and rooms, and is easily adjustable for these open spaces. The modern iron build of the gate is suitable for any style of house or building, and the strong metal holds in young children of all ages, and even animals. The gate also connects to other panels, making it extendable. The gate comes with a screwed-in mount for walls, so it is durable, even when faced with pressure from children or animals. Some complain the screw-in mount can damage plaster, hardware, and other delicate building materials. Others also say it is difficult to get through the gate when holding a small child because of the narrow door and at times tricky opening. 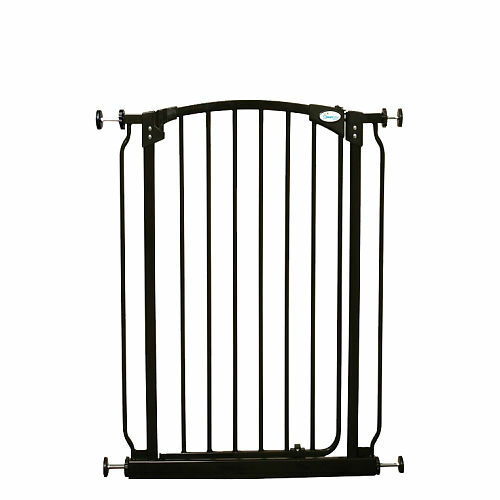 However, the majority of customers rave that this is one of the best baby gates on the market because of its style and strength for the price. This's an amazing product at a very reasonable price. Love, love, love this gate and have no regrets. Summer Infant - Decorative Extra Tall Gate, It's a good product, safe, beautiful and helps children to not run away, is very heavy, I liked it but thought it'd come with something more Enhanced the lock, I think just missed it. They all thought it was a far more expensive gate than what it's. I highly recommend this gate for children or dogs. The Price is a bit high, so expect more. The automatic close and locking feature are wonderful additions to this gate! It's made of actual iron and is heavy duty. We love this gate so much, we'll be ordering a few more. The height is wonderful, it's very attractive looking, it's easily installed without harm to your home, it's easy to operate with one hand, the self-closing feature works great (sometimes you've to make a few adjustments for this to work correctly), it's sturdy, economical...and just plain wonderful! It's sturdy and provides flexibility in height installation (allows our cats access underneath) and for width. Highly recommended over dozens of others reviewed and several actually tried and returned. This gate fits most any dacor - visitors always remark how unlike typical wood or metal gates these appear and how easy to use for a first time user/visitor. The height of this gate was the original appeal, however the hardware and material used are durable and certainly designed to last. I'm very pleased with my purchase and would recommend this gate to anyone. We've purchased and returned other gates we presumed similar but lacked the versatility, ease of assembly and visual attractiveness. We read all the reviews and did our homework prior to purchasing a gate and the Summer Infant brand surpassed all. Solid construction and easy to install. Solidly built, easy install and easy to move to another doorway. This's a great gate extremely easy to install and I love the door on it. The gate is very sturdy and easy for us adults to lock and unlock. Pressure mounted or hardware provided for permanent installation. Safe and effective for kids, the latch is easy for a 6 year old to figure out but not easy enough for a 2yr old. Everyone that's come into my home since it was installed is very impressed with the looks. It's well built, easy to set up, works great. Very nice gate, works great. It works fine with low upper tension, but then the upper lock mechanism doesn't work. This gate works well for my stairs. It seems this gate, though has same open/shut mechanism seems to work a little better. A little inconvenience but it works. This gate works very well for keeping my daughter's puppy in the mud room and out of the kitchen. Well the gate arrived today and I sat on the kitchen floor and got right to work. Adjust and it works great! We're planning on buying the same one for the top of our stairs to match. We bought this gate for the top of our stairs. The top of the stairs has a larger opening at the top, smaller at the bottom. One at the top of my stairs installed against a wall and the banister. With some adapters (that I'd to buy elsewhere), this gate looks beautiful at both the top and bottom of the stairs. 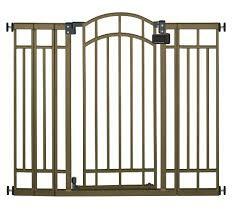 I bought this gate to keep my english bulldogs out of hallways ans at top of stairs. We were looking for a gate that'd work and look good with our metal stair banisters. i use this gate at the top of the stairs to keep my 15 month old son out. I installed it using the pressure mounts ONLY at the top of stairs due to old plaster walls and baseboards I didn't want to screw into. I'll have to return this and hunt the internet for a real "hardware mounted" gate that'll fit the large opening at the top of the stairs. Easy for an adult to open with one hand. The door opening is rather narrow. Sometimes takes me 2 hands to open. I initally bought this gate for the opening between my living room and kitchen. I really love the way the gate looks and it was nice at first, but after a couple uses the gate was really hard to open...impossible to open with one hand (while holding my child). Well about 2 weeks after that the sliding piece on the top that you're supposed to slide over before lifting the gate to open doesn't work... you don't have to even touch it to open the gate, just lift and the gate swings open. it's easy to open and close also. Wide enough for my odd length opening. Would be hard to open if carrying a baby or basket of wash. Also, it's a narrow opening. Actually bought two for different openings and was able to combine unused panel from one unit to bridge a larger opening with the second unit. They work well with keeping my grandchildren out of areas that aren't safe for them to be in unsupervised. They work well with keeping my grandchildren out of area's that aren't safe for them to be in unsupervised. 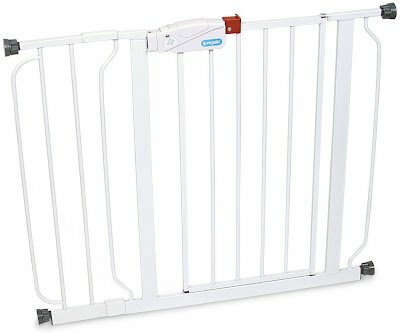 I ordered 3 gates to keep our dog off the carpeted areas of the house. See the video I made here to see baby and gate in action: https://youtu.be/mfvaSvlc9N4 Pros: 1. Walk thru gate 2. Extra tall 3. Sturdy 4. Definitely stylish, looks nice in home 5. Option to use hardware mounts for stairs 6. Easy to install 7. Easy to use (slide release button, lift gate, and open) Cons: 1. Limited walk way use because gate isn't very wide, had to purchase extra long gates for other entryways 2. Baby (8.5 months) likes to pull himself up with the gate. The gates also look nice, more decorative and the extra sections worked well for my strangely sized doorways. Both gates fit well enough out of the box. It's hardware screwed into the wall to hold a pressure mounted gate. The gates really can be opened one-handed and really do swing closed independently! If the gates are installed correctly, they'll work correctly. I bought the first gate and it came broken in the box where the hinges open on the gate, so i figured order 2 more so if ones broke, ill have a backup well the other 2 were alright so i decided to order one more for one for other room. We did screw the four caps into the door opening. It's easy to set up, looks great, and the bars are close enough together that my 8lb dogs can't squeeze through. I bought it to keep my small dog from going upstairs. I bought these to keep our dog in the kitchen when we're out shopping, works like a charm, very good construction and easy to assemble. It looks nice, it's sturdy, easy to use and the self closing feature works well for us. Perfect for keeping my dogs out of the 'dog free zones in my home. The gate looked nice, but it difficult to keep between our paneled wall and banister. I'm using this gate to keep my 4 large dogs out of my kitchen and living room. I bought this gate for my dog. It's easy to set up, looks great, and the bars are close enough together that my 8lbs dogs can't squeeze through. We bought this gate to help with our 3 dog household. Review of - North State Natural Wood Extra Wide Swing Baby Gate, 60"-103"
Review of - North States Heavy Duty Stairway Baby Gate, 26"-41"